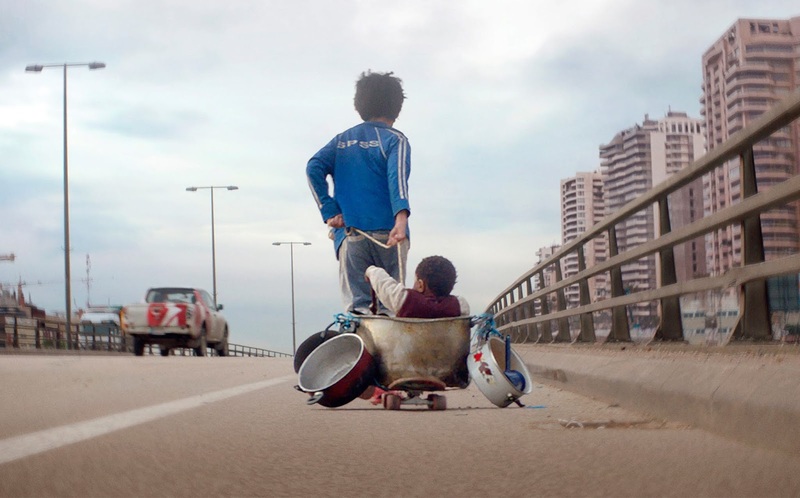 A harrowing street children drama, Capharnaüm (also known as Capernaum; the title is translated as "Chaos") descends into the abyss of human suffering. 12 year-old Zain (Zain Al Rafeea) is serving a five year sentence in a penitentiary for a stabbing offense. He re-enters the courtroom, this time to sue his parents Souad and Selim for ever giving birth to him. Most of the rest of the film unfolds in flashback. In a derelict neighbourhood of the Lebanese capital Beirut, Zain, his parents and his many siblings survive in abject poverty. All the kids sleep on a single mattress, food is scarce and schooling is out of the question. Zain is protective of his sister Sahar, who is only one year younger, and together they sell trinkets to passing traffic. Zain also works as a delivery boy at the corner store run by Assad. When Sahar starts to menstruate, Assad sets his eyes on her, and Souad and Selim spot the opportunity to sell their daughter into marriage. Zain is incensed and flees home, eventually stumbling upon Ethiopian undocumented immigrant Rahil (Yordanos Shiferaw). She is the single mother of toddler Yonas and working as a cleaning lady, but always short of the cash needed to buy forged permit papers from fixer Aspro. Zain babysits Yonas in exchange for shelter at Rahil shantytown dwelling. But then she goes missing, and Zain is left on his own to care for baby Yonas. 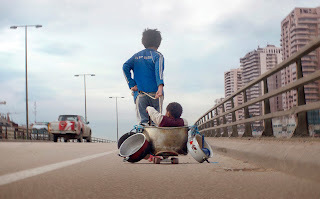 Filmed over six months on the streets of Beirut, Capharnaüm is a draining experience. Amalgamating fragments of themes from the mind of writer and director Nadine Labaki, the film is an unrelenting journey of despair. Touching upon absentee parenting, the bond between siblings, child abuse, child brides, illegal immigrants, displaced Syrian refugees, prison life, human smuggling and finally the opportunity for courtroom retribution, Labaki covers plenty of ground in pursuit of painful realities in the lives of the underprivileged. It's never easy spotlighting extreme poverty without exploiting it. Dancing somewhere between condemning irresponsible parenthood and perverse finger-pointing at miserably uneducated adults, the film doubles down on the plight of children. Just when it appears Zain is a defenceless child left to his own devices, Labaki elevates him to the role of caregiver, and in toddler Yonas hammers home the agony of the truly defenceless. The infant recruited into the role of Yonas appears to have endured some interesting moments during filming, but his pure innocence is the faint light most threatened in an uncaring world. By the nature of the film's construction, character evolution is limited over the two hours. Zain repeatedly demonstrates remarkable resiliency and inventiveness to survive every ordeal and seemingly impossible test, but otherwise the story piles on the agony rather than providing opportunities for growth. And Labaki does extend several scenes longer than needed, often prolonging the suffering well after the point is made. Reasons for optimism are few and far between, but do exist in fleeting moments. Rahil's dedication to Yonas is the most obvious argument for hope. Elsewhere a stranger offers a hungry and lonely Zain a free sandwich; bus drivers accommodate the child, and some symbols of the Lebanese state appear to function, including the court and refugee aid distribution systems. 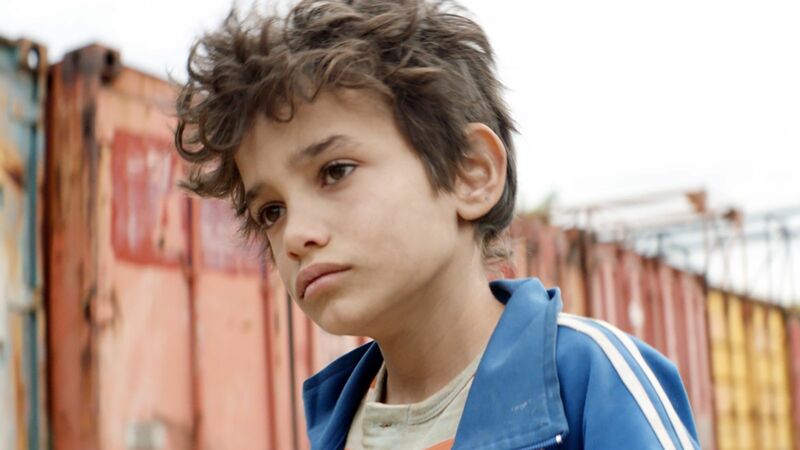 Labaki used mostly amateur actors, and Zain Al Rafeea, himself a Syrian refugee, is an affecting presence, moving through the unwelcoming streets with unsmiling determination. Yordanos Shiferaw was formerly an undocumented worker, and provides the one adult counterpoint to Zain's parents. Capharnaüm is a mirror held up to a world too often dismissive of extremes in wealth and poverty. If no one else is, the victimized children are attentive, hatred building in their young hearts.